During the Great War, several institutions in London were refitted as auxiliary hospitals to treat the wounded servicemen returning from the battlefields. With large numbers of hospital staff heading to the front lines or volunteering for the war effort, some smaller hospitals even refitted their premises to contribute to the war effort. 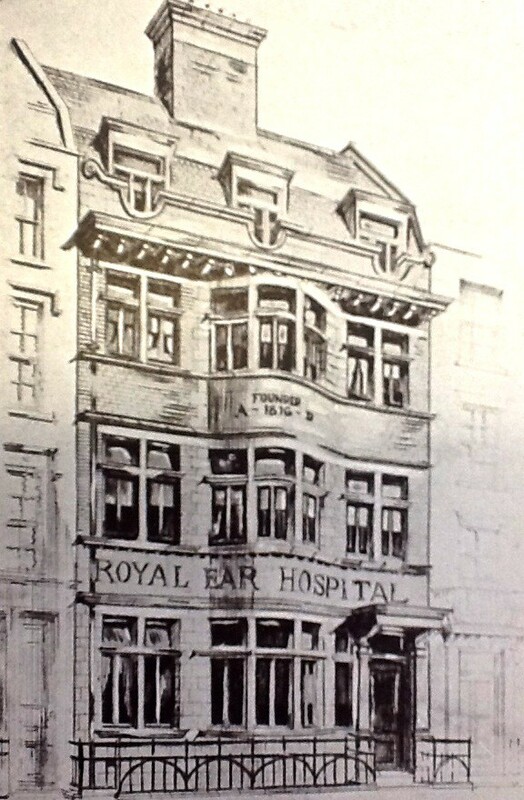 One such volunteer hospital was the Royal Ear Hospital, formerly the Royal Dispensary for Diseases of the Ear. Located on 42-43 Dean Street, Soho, the hospital provided specialized treatments for aural diseases since its founding in 1816. As practically the entire staff of the institution was depleted by military duties or volunteer service during the Great War, the hospital closed down. In August 1914, the Governing Committee unanimously resolved that the building should be offered to the Red Cross Society and beds temporarily placed at the disposal of the War Office, for the benefit of soldiers suffering from deafness or ear injuries inflicted during the war. The offer was promptly accepted and 20 beds were reserved for the use of the Navy, though a smaller outpatient clinic overseen by the aural surgeon MacLeod Yearsley still operated in London. It occurred to us that we must decide whether we should still require that only ear cases be sent or should admit other than ear cases. We are agreed I think that the administration should be entirely in the hands of the Committee and that if we reopen, all the medical arrangements [should] be left to the Medical Board. It was decided that the hospital would deal with ear cases that were too complex for the physicians or surgeons to deal with at the Naval Hospitals, but also welcome general injuries if needed so by the Admiralty. Yet, apparently there was still plenty of space being unused at the Royal Ear Hospital during the Great War. As I was examining the archives of the hospital, I came across interesting correspondence between the Committee and a Mr. Peter Gallina, proprietor of the Rendezvous Restaurant that occupied space next to the hospital. The Franco-Italian restaurant was praised for its clean kitchen, economic cookery, and tasteful interior, and became one of the “landmarks” of Dean Street, catering up to 200 people. not regard the offer of £50 per annum for the two vacant floors of the rear of the hospital as particularly good. It would be much more tempting of he paid a premium of say £100. Even in that case it would be prudent for the hospital to insist upon payment of the rent in advance annually. If Mr. Galilna were to use the premises solely for the purposes of storage and cellarage and not as lavatories for his staff, a former objection to his proposed tenancy would be eliminated…I think it would be quite easy for Mr. Gallina to have an opening cut in the party wall which separates the back of his restaurant from the room under your Children’s ward. The Committee decided to decline the offer on the recommendation of Collard and Mr. G.H. Paine, another of the Committee members. However, meeting records of the Royal Ear Hospital Committee of Management dated to March 1921 reveals that the Committee reconsidered the offer. They unanimously agreed to recommend that the proprietors of the Rendezvous Restaurant be offered two rooms at the rear of the hospital for a tenancy of one year, and such tenancy thereafter subject to termination by either party at 6 months’ notice, for a yearly rental of £150. The proprietors renegotiated the offer for storage purposes on a 7 year lease terminable at the end of three or five years at the option of the hospital. Discussions continued on with the Committee, largely due with heavy costs associated with renovating the rear rooms into wards. They kept tabling the discussions to analyzing the cost-benefit ration of renovations, the amount of financial support, as well as for an analysis of waiting lists of patients. Changes recommended including another ward for isolation cases, a lavatory and bathroom strictly for the House Surgeon, and the addition of extra baths. Minor renovations were made, including the addition of four extra beds, and a makeshift waiting room with a curtain for the Sister-in-Charge. No major renovations were made: in 1920, it was announced that Mr. Geoffrey Duveen, supporter of the hospital and once on the Governing committee, donated £50,000 to build a new building for hospital on a piece of land purchased on Huntley Street. Judith Walkowitz, Nights Out: Life in Cosmopolitan London (University Press, 2012), 101-2.